One of the benefits of having boys--once done with potty training, I am now forever excused from bathroom duty. Phew! So, what really goes on in there... I don't think I want to know. Barley makes a bee-line (or would that be a p....oh never mind!) for the adult height one. He can just barely clear it with his, umm, "equipment" shall we say? 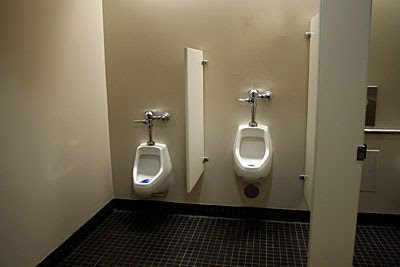 Leaving DH to use the child-height urinal. Not only does DH have to aim at a target that is further away than normal, he also must endure the unearthly CACKLING of the boy next to him who made his Dad use the kid version. You fathers of daughters out there are missing out on some prime bonding time here! Why do I find such humor in inappropriate things? My father would have picked me up mid-stream and moved me. And I'm sure you would have (for survival reasons, if nothing else!) avoided what Barley's reaction would likely be to that--using that as excuse to water Dad's shoes for him!